Why do so many people choose to ignore God great gift of salvation? It’s puzzling why people knowingly and openly display their arrogance against God’s mercy and how others accept and applaud people for being arrogant. Salvation seems to be the last thing on most people’s minds, taking extreme events such as 911 to bring people running for the churches. Once realized events such as 911 are not going to hurt them personally, people stop going to church as quickly as they ran to them when they feared for their lives. I write this because Scripture tells us a time will come when people will be full of fear but their cry will not be heard because the time of mercy and salvation will be over. We know from the Medjugorje visionaries there will be a series of 10 warning signs/chastisements given to the world. Medjugorje visionary Mirjana has mentioned how frightening the latter events are. These warnings and chastisement are a strong wake up call for souls who are far away from God. They will come as a last resort because God desires not one soul is lost to the wolves and evils of this world. God is giving us every opportunity to have a change of heart and mend our way before it is too late to obtain mercy and salvation. Sad to say most continue to be arrogant thinking they can come running at the last possible minute and obtain salvation and mercy but these who think this way are very wrong. In this parable we find five came prepared and five did not. While the five who were not prepared went to get more oil the door opened and in went the five who were prepared. When the others returned the door was closed to them and though they pleaded for mercy that the doors would be open, the reply they received was, “I do not know you.” Scripture also tell us the time will come when many will stand before the throne on judgment and will say, “Lord did we not do great things in they name?” And the reply will be, ‘Leave me you worker or iniquity for I do not know you.’ These Scriptures clearly tells us not all will obtain the mercy and salvation needed to enter into the Kingdom of Heaven and or Eternal Life. "Dear Children! Also today I call you to conversion. May your life, little children, be a reflection of God’s goodness and not of hatred and unfaithfulness. Pray, little children, that prayer may become life for you. In this way, in your life you will discover the peace and joy which God gives to those who have an open heart to His love. And you who are far from God’s mercy, convert so that God may not become deaf to your prayers and that it may not be too late for you. Therefore, in this time of grace, convert and put God in the first place in your life. Thank you for having responded to my call." 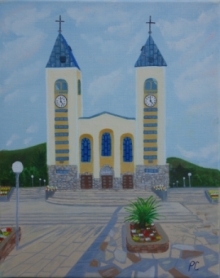 Just like the 5 virgins who show up too late, or those before God who cry, “Lord did we not do good things in thy name,” Our Lady of Medjugorje tells us a time will come where those who are far away from God will pray for His mercy and those prayers will fall on deaf ears because it is too late. The time of God’s mercy and salvation will be over. “Dear children, do not be of a hard heart towards the mercy of God, which has been pouring out upon you for so much of your time. In this special time of prayer, permit me to transform your hearts that you may help me to have my Son resurrect in all hearts, and that my heart may triumph. Thank you. In this message we again find that many in this world choose to have a hard heart toward the mercy of God. I would like to give some examples of what I have seen lately that frightens me to death. Most of us know by now that Britney Spears has fallen off the deep end. Young girls idealize Spears and the message I see she is sending the youth who love her is, it is okay to go ballistic, give your kids up, and party hard. Actress Lindsey Lohan has been in troubled for alcohol and illegal drugs yet Hollywood continue to support this young actress giving her continued movie roles. This send a horrible message to our youth which says, “it is okay to drive drunk, and drink alcohol and do heavy illegal drugs such as cocaine, so go ahead enjoy and don’t worry about a thing because it is cool." Paris Hilton spent time in jail as we all know. Upon release she did an interview with CNN’s Larry King. In that interview Hilton said she has changed her ways and has seen the light. She said she spent her time reading the Bible while in prison, yet when Larry King asked her what her favorite Bible verse is; Hilton clearly displayed a blank look on her face. She got caught in a lie as she could not come up with one word of a Bible verse. Hilton also said she was going to do work to help the poor in other countries. To date, Hilton has not done a single thing to help one single person in a poor country since her release from prison in June of 07. The message to our youth here is it is okay to go to prison and get in trouble and to say you will do good things and for it all to be a lie. Meanwhile Hollywood still supports Hilton as she just completed another movie. As if the above is not enough, I am sure you have heard of the cartoon series, “King of the Hill,” well in one episode housewife Peggy impersonates a nun and the segment is not pretty. I viewed it as a shameful act against the Catholic Church. In Boston a TV ad of late shows 3 nuns as artists, they are shown with big smiles on their face as they are painting a muscular naked man. The ad is for a fitness center. The arrogance against God’s mercy is shameful in this ad. Many may not know that our Federal Government gives grants to artists. One artist named Andres Serrano obtains a very nice amount of money from the Federal Government and with his grant he created “Piss Christ.” What he did was to urinate into a jar and to put a crucifix of Christ into the jar and put the lid back on the jar. This so called work of art was displayed in an art museum and was a winner of the Southeastern Center for Contemporary Arts Awards in the Visual Arts sponsored in part by the National Endowment for the Arts. It is most difficult for me to understand how an artist can put Jesus in a jar of his urine, get paid to do it, win awards by the prestigious National Endowment of the Arts and for the world to applaud this work as being extraordinary. Such work is not extraordinary it is discussing and an attack against Christianity. All these things seem socially acceptable within hearts and minds of those who continue to refuse the mercy of God to the point they laugh at it, poke fun at it and give awards for it. If Piss Jesus had been Piss Mohammad you can bet some building in the U.S. would get blown up. A good example of this is British teacher Gillian Gisbons who was charged in Sudan for religious hatred. Gisbons was given a teddy bear by her students in Sudan and they wanted the teacher to name the teddy, so she named it Muhammad. For naming her teddy Muhammad her punishment was 15 days in jail. She escaped a back lashing only because of English intervention on her behalf. She was also thrown out of country of Sudan. Hollywood's attitude toward Christian subject matters are most often taboo to the industry much as a teddy named Muhammad would be in the Sudan. It is no secret Hollywood is not very up on Christian actors and or Christian religious films. Just released is a new movie this February called, “Fool’s Gold” staring Matthew McConaughey and Kate Hudson. The trailer showing on TV to promote this movies shows Hudson stomping her feet saying, “I cant believe I just made love in a church.” I have to ask out of a movie that may be some 2 hours long why would anyone choose this one movie trailer to appear on TV? I also have to ask why anyone would think such a bit in a movie would have any redeeming value. These type evils are happening because people are refusing God and laughing at His mercy and salvation. On one hand we are told under the Fifth Amendment of the Constitution we have a right to "freedom of religion" but that right is being taken away by those who are stomping on others who choose to be religious. The music industry is no different these days then is Hollywood. This years Grammy’s gave the “Best Song of the Year Award” to confessed drug addict British Rocker, Amy Winehouse. The song title she won a Grammy for is called, “Rehab.” In the lyrics of the song we will find the following words, “They tried to make me go to rehab, I said, ‘no, no, no.“ The message here is it is okay to be a dysfunctional addicted drug addict and to make a song telling the world how screwed up you are and for doing this the world applauds you and give you a Grammy Award for excellence. Is there something wrong with this picture or am I missing something? It seems to me the world has been turned upside down. Our society is demoralized, wrong is right and right is now wrong. I could go on with a large list of other issues all which make me scratch my head asking how can this be but I think everyone has the picture of what I am trying to get across here. What I see is a very large population of the world seems to have it all backwards. They choose to go against what is right and choose to rejoice over wrongs. Our society has long since become demoralized which I believe is now a plague of no return. For these and like actions in our society, Our Lady of Medjugorje has said, “You who are far from God’s mercy, convert so that God may not become deaf to your prayers and that it may not be too late for you.” A time is coming when great suffering will be upon this world that refuses the mercies of God. Running to pray in a church will do no good, for the times will be likened to the 10 virgins who did not bring enough oil for their lamps. The door of mercy and salvation will be closed!